One-of-a-kind, framed Nightmare Before Christmas Film Cell. Fans of The Nightmare Before Christmas will want this to their wall! This one-of-a-kind, framed Nightmare Before Christmas Film Cell measures 20-inches tall x 11-inches wide. Limited to 2,500 pieces worldwide, it presents prints and actual cells from Tim Burton's unforgettable movie. 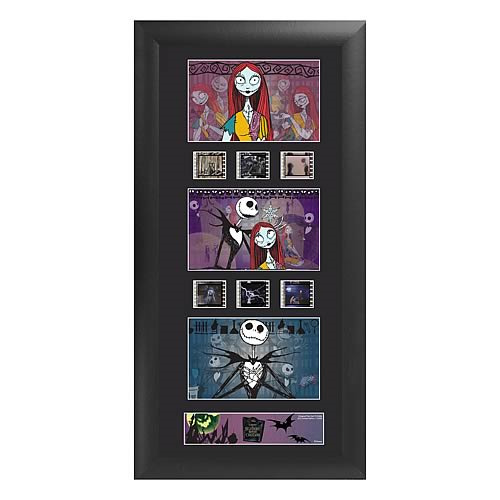 Fans of The Nightmare Before Christmas will want this triple film cell on their wall! Please note that the actual cells of film may vary from piece to piece, as they are hand selected from reels of film. Ages 13 and up. It's the same routine every year in Halloweentown. On Halloween, the monsters come out and perform a real scare. This particular Halloween, Pumpkin King Jack Skellington, bored of the idea, saunters off into the woods with his dog Zero. At the break of dawn, he discovers a clearing of trees with different doors representing various holidays. The Christmas Tree door attracts his attention and upon entering the world of Christmas, Jack is fascinated with this new idea of Christmas that he absolutely must share with the citizens of Halloweentown!